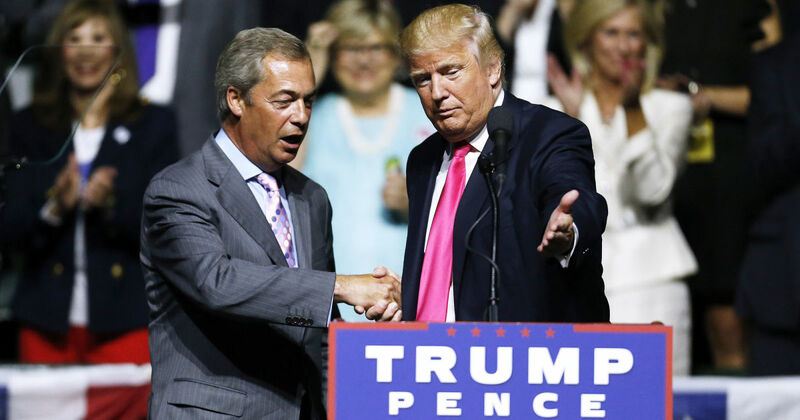 Mythological Ponderings: Sorry Donald, but your victory is the antithesis of Brexit. Sorry Donald, but your victory is the antithesis of Brexit. Donald Trump winning the US Presidential election is the biggest political upset since, well, only June as it happens. A completely unexpected result, Trump's victory has been likened to the UK vote to leave the EU on June 23, not least by the man himself, who earlier this week described the possibility of him winning as "Brexit plus plus plus." There's no doubting that both results gave the establishment a bloody nose, but the comparisons between the Donald's rise to the White House and Brexit have been massively overblown. In fact, putting aside the rejection of the status quo, the two are practically antithetical. For starters, Trump's platform railed against free trade. He constantly denounced NAFTA, and threatened to pull out of the agreement if Canada and Mexico were unwilling to renegotiate it. On top of this, Trump also threatened an all-out trade war with China, suggesting the introduction of tariffs, the bringing of trade cases against the country at the WTO, and labelling it as a currency manipulator. Compare and contrast those protectionist instincts with the Leave campaign's message on trade. The cornerstone of the Brexiteer's message was the ability, freed from the EU's common external tariff, to sign our own trade deals with countries across the globe. Campaign literature, both official and otherwise, was awash with statistics showing where the current growth was in the world, which emerging economies would be the powerhouses of the future, and how our share of exports with the rest of the world was increasing, whilst that into the EU was in decline. Trump sought to be elected in order to make trade with China as difficult as possible. We voted to leave the EU in order to make it easier. This isolationism can be found elsewhere in Trump's policies too. The president-elect has described NATO as 'obsolete', and has suggested he would look at pulling the United States out of the agreement. Compare and contrast, once again, with the Leave campaign. On security, one of the main tenants of the Leave position was that the EU's expansionist policies, and plans for an EU army, threatened to undermine NATO. When Remain supporters suggested that peace in Europe since the second world war had been secured by the EU, leavers pointed out that this had much more to do with the North Atlantic alliance than Brussel's bureaucracy. A desire to ensure NATO is maintained as the strongest military alliance in the world, not weaken it exponentially by pulling out of the agreement, was a core part of the Leave position. Even on immigration Trump and Brexit are worlds apart. Yes, there was a strong part of the leave campaign that wished to control immigration, but the key word there is control. No-one on the leave side advocated closing the borders completely, but rather sought to ensure that the level of immigration into the country was manageable. Moreover, in the wake of the referendum result, Leavers have been just as aghast as Remain supporters at May's refusal to guarantee the rights of EU citizens currently in the UK to remain here. How diametrically opposed is this to Trump's call to deport 11 million people and ban all Muslims from entering the United States? The equivalency is a spectacularly false one.